US forces have admitted mistakenly killing nine children when they bombed a target in southern Afghanistan. US military spokesman Major Christopher West said they had acted on information that a suspected terrorist was at a house near the city of Ghazni. Ground forces later found the body of the intended target along with those of the children nearby, he said. Major West said the US military regretted the loss of innocent life and would seek to explain the incident. He said the suspect was thought to be behind the murders of two foreign contractors working on a ring road. 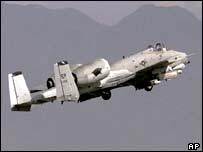 Acting on "extensive intelligence", he said, an A10 "Warthog" - a heavily armoured plane - was called in and opened fire on the isolated rural site at about 1030 local time (0600 GMT) on Saturday. The attack was precisely targeted - it hit one house without damaging others in the area. The US military followed "stringent rules of engagement" to avoid such incidents, Major West added. A commission had been formed to investigate the scene of the incident, he said. Afghan Government sources said they believed the incident was a mistake. The BBC's Crispin Thorold in Afghanistan says the attack was very targeted, but that intelligence was not as good as it should have been. He says local people - who are already sceptical of the US presence in the region - feel considerable resentment and anger in the wake of the attack. It took place in a town where there is strong support for the ousted hardline Islamic Taleban and the Hezb-e-Islami group, also fighting the coalition. Saturday's bombing is the latest in a series of attacks by US-led forces which have resulted in the deaths of dozens of Afghan civilians since the start of the campaign against the Taleban and al-Qaeda in October 2001. 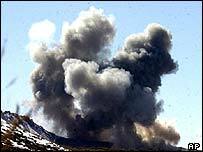 Afghan officials said in September eight nomads were among 10 people killed when US forces bombed targets in a massive offensive against suspected militants. The US military is investigating that attack after initially denying any civilians were killed. In July last year, American forces killed at least 48 civilians when a stray bomb hit a civilian area in the southern province of Uruzgan. Twenty-five of the dead were from a single family attending a wedding. Although in many areas Afghans welcome the presence of American troops and other foreigners, there is hostility in some southern and eastern parts, our correspondent says.